Cap Connection only stocks running boards, nerf bars, and steps for trucks from the most dependable manufacturers. We guarantee we’ll have the perfect solution for your lifestyle and the style of your truck. Carr truck steps are made right here in the USA. They are extremely durable and will withstand the elements no matter where you’re driving. We carry a variety of Luverne products for trucks including the Grip Step running board and Regal 7 oval step running board. Westin running boards give you an excellent combination of style and functionality. Westin’s Sure-Grip running board is built with durable extruded aluminum and has a rubber step that offers extra grip. 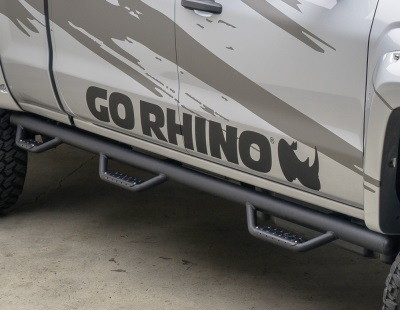 Cap Connection carries the Dominator line of side steps from Go Rhino. These steps are lowered hoops instead of a straight bar style. We carry the Dominator D2, D3, and D4. Stop in at Cap Connection in Waukesha to pick out the best running boards or side steps for you and your truck. Our knowledgeable staff will help you select the best option and can install it for you. Contact Cap Connection for information on side steps and running boards for sale in Waukesha.